In January, my sister-in-law’s friends were visiting Barcelona for a long weekend. I had never met them before, but it was no surprise that they were lovely people. I was happily invited along to several restaurants that catered to vegetarians, and in general, they also have GF options so I could partake in the feasting. I wasn’t focused on writing posts about the first two places we went to, but the third one they selected especially for me, and I was armed with a notepad and a camera. Behold the gilded chandelier illuminating your dish. 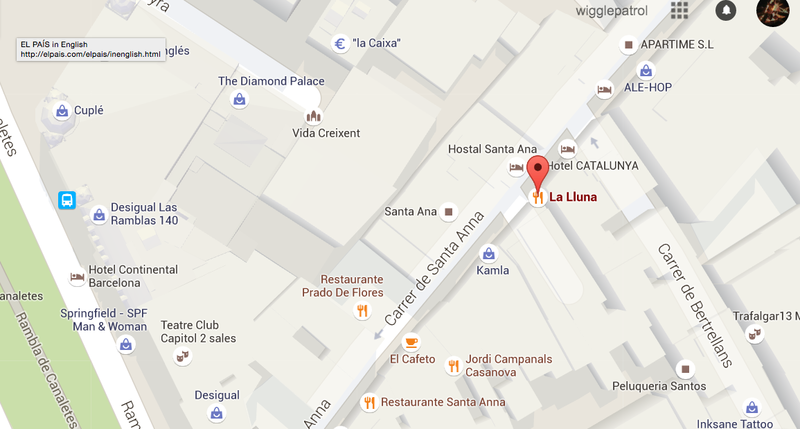 La Lluna, or The Moon in Catalan, is located in the Gothic Quarter just steps off Les Rambles and serves gourmet traditional Catalan cuisine. You enter the restaurant through a classic Barcelona, quaint cobbled alleyway, and emerge into a large dining room decorated tastefully in a faux royal style, reminiscent of a lesser duke’s castle. When I arrived at 8:30 pm, I was the first person there for the dinner service. There was not another soul in sight except the kind waiter who brought me to a table, and this is not unusual for Spain. People here generally don’t arrive for a dinner out until after 9. As I must have looked lonely being the only one in a huge space, the kind waiter gave me a complementary cava and primed my evening with a fizzy bliss. Salud! Here’s to a great meal! By the time Bobby had arrived, I had already perused the entire menu and gotten all of the important information I needed for this post. My plan was set, and I was anxious to order. La Lluna offers a 3 course menu for €15.00 for dinner, which is a unique feature. Most restaurants have menus like this, but only during lunch hours and dubbed Menu del Dia. Its always nice to find a late night bargain. It actually makes the food more enjoyable knowing that the price is right. As far as the actual menu goes – the one you hold in your hands – La Lluna has been very helpful for coeliacs and vegetarians. They indicate if a dish is gluten-free or can be amended to be GF upon request. This makes it very helpful, because many traditional Catalan dishes are seemingly GF but have hidden threats lurking below the radar. It was very exciting for me also, to finally get to try things that I have always seen, but have never been able to eat before. They way a Menu works is that you pick a ‘Primer Plat’, or Starter, a ‘Segon Plat’, or Main Course, and ‘Postre’, or Dessert, and they deliver them in that order. This particular 3 course menu does not include drinks, so with a ‘beguda’, or drink, and tax, your meal will cost about €20. For my Primer Plat, I chose the botifarra amb mongetas. Botifarra is a Catalan sausage based on ancient Roman recipes and comes in many different colors. In this case it was black botifarra served on top of a white beans that were cooked in garlic, butter, and parsley. I had always seen other people eating it, but had been told that the sausage is normally made with bread crumbs inside to get the classic texture. It was delicious to say the least. They even have gluten-free bread -freshly baked! For my Segon Plat, I went for another traditional dish that is often served with a gravy or sauce that is thickened with flour. Here, however, the galta, or pork cheek, was braised in a delicious BBQ style sauce and indicated as GF on the menu. I had to have it! It was served with creamy, well seasoned mashed potatoes, which is one of my favorite BBQ sauce absorbers. The meat itself was tender, juicy, and fell right off the bone. My friend chose all non-GF items – but he said they were fabulous too. Lastly, and one of the most anticipated for me, was the Postre. I ordered the coconut cake with homemade chocolate ice-cream. Any time there is a GF cake on a menu here its a MUST order, because finding them in a restaurant is quite rare. The cake was moist, flaky with shaved coconut, and absorbent of the dark chocolate sauce that was drizzled on the plate. The ice-cream was a great accoutrement to the overall flavors. Yum! So, if you find yourself in the Gótico of Barcelona looking for a finer dining experience, La Lluna is a good place to go. The wait staff was friendly, the environment comfortable, and the food amazingly delicious. There were no dishes that we didn’t like and no rude people to ruin our buzz. I, like many Yelpers before me, give this place a high recommendation. Bon Profit!